'We Are Here': Questions For Comics Creator Taneka Stotts Taneka Stotts is a powerhouse comics creator and editor, and a persistent voice for change in the industry. 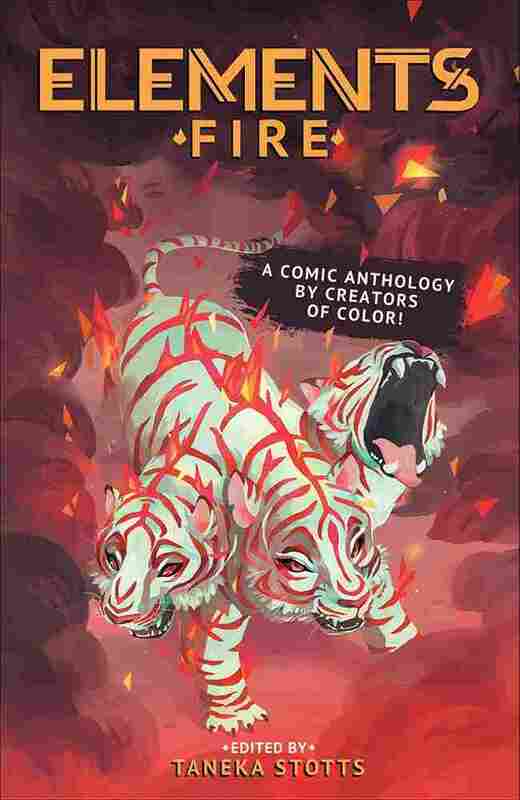 Her anthology, Elements: Fire won an Eisner Award at San Diego Comic-Con in July. Creator Taneka Stotts holds a copy of her Eisner Award-winning anthology Elements: Fire. When comics creator Taneka Stotts accepted an Eisner Award — the comics industry's highest honor — this year for her anthology Elements: Fire — A Comic Anthology by Creators of Color, she was fired up. A Comic Anthology by Creators of Color! "I hold this award," she said, "and I declare war on the antiquated mentality that tells us our voices and stories aren't 'profitable' enough ... we're not waiting for you to catch up anymore. We are here, we have always been here, and we will do as you've always told us. We will make it ourselves." And she's doing just that. 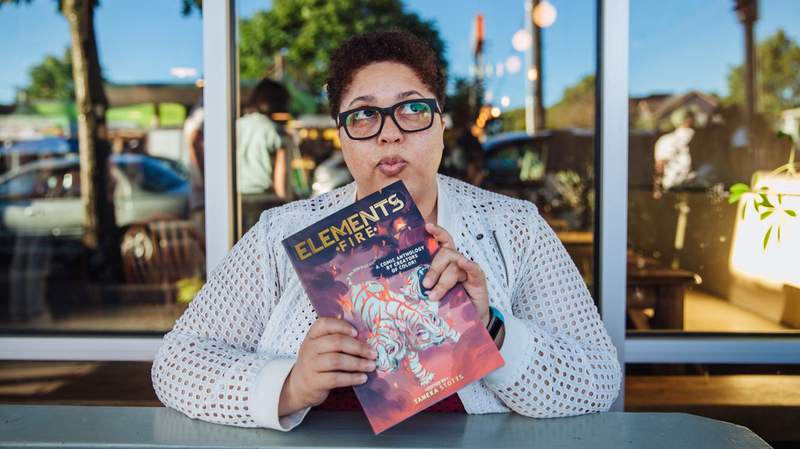 Not only is Stotts a creator and a writer, she's a self-publisher and an editor, organizing anthologies like Elements: Fire, which features 23 stories from creators of color based in the United States and around the world. She's already working on a follow-up anthology Elements: Earth. I sat down with Stotts the afternoon before the Eisner awards ceremony, and we talked about why she calls Elements "the little book that could," and about whether it gets tiring, being a voice for change in the comics community. So tell me, what was the first idea you had for Elements? How did it start? Elements: Fire was born from my desires and passions that I found sparked within me after doing Beyond, a queer sci-fi and fantasy anthology. It was literally knowing the empowerment and knowing the power of my community who were coming to back me — but not only that, but back the belief in our books. I wanted to see if I could create the same spark with an anthology that focused on creators of color only and made its own substantial change of no longer telling non-fiction stories, slave narratives, or refrigerated narratives where we were the sidekicks. Instead, we're the main characters, we're not the token characters, and we're taking our adventures on a completely different level where our narration is no longer whitewashed and it's no longer controlled by a medium that would like to see us palatable for a national audience. How did you settle on the concept of elements? I'm very witchy with it! I have this vibe of earth, wind and fire inside of me — and I don't just mean the song, "September." I was born from a very great set of parents who infused me with the power of using my imagination, and my imagination was sparked by elements and things that are within me. I'm made of fire, earth, air and water — so I would like to see that reflected in the works that I work on. I felt that no one would believe in me when I first started [Elements: Fire], so I decided to go out with what I felt was the biggest passion: fire. That's how that became our major theme and the core focus of the book. You've been very pointed in your criticism of the comics industry, especially in spaces for people of color. You've talked a lot about diversity and representation in comics, and a frequent pushback that I see is "if you don't like it, just go make your own." As a woman who has made her own, how do you respond? HA HA! I'm getting nominated for an Eisner now! [Editor's note: she won] See what you started? It's pretty simple. "Alright, if you want us to make our own, do not cry when you are moved and pushed away because our talent outweighs yours." Sorry, I'm going to be very cocky about this. I am tired of being told that creator of color stories should be told but only if they're "good." [People will ask me,] "Are the stories in your book 'good?' Do you have 'good' stories?" Do not ask me those questions anymore. I have gotten to where I'm at, so it should be obvious that the stories ARE good. I am tired of being told that creator of color stories should be told but only if they're "good." ... I have gotten to where I'm at, so it should be obvious that the stories ARE good. It's always frustrating to hear that, because people of color are already making "good" comics! We've been there so long! This isn't new! I'm not pushing anything that has not already existed. I am just being the loudest person in the room who finally gets a seat at the table. I do not applaud anyone or give them a gold star for finally recognizing us, but I certainly am applauding all of the folks who are coming up, making a difference, because it's what we should have been doing from the get-go. You've also been outspoken about other issues — sexism, racism, homophobia, sexual harassment — does it get tiring to be that voice? NO! I feel like a broken record at this point, because the voice only reaches so far — and when other voices dissent your voice constantly, repeatedly, or at a higher level like in politics, you do have to continue like a broken record, regardless of how tired you are or how many people say, "You know, I wish you would quit talking about x, y, and z." I'm sorry, but I have to keep educating people because, though I'm 30-odd years old, people still haven't learned anything. People haven't changed. 50-year-olds are just now figuring out that racism is a bad thing, so obviously we need to keep repeating these lessons, because they haven't figured it out yet and they sure don't seem like they're getting the whole message either. You won an Ignatz Award, and now you've been nominated for an Eisner — both for outstanding anthology. Did you think this would happen? I'm completely shocked. I still am shocked. I'm still having problems putting it into words completely. Elements wasn't made to be an award-winner. Elements was just made to exist. It was everything I wanted to see in a book manifested physically, things that I never saw when I was growing up, that I lusted for so greatly in my older age. I wanted to make sure these stories existed for my nieces and nephews, pretty much everyone who was coming up behind me. So I made them exist. I did not expect to make it nearly as far as I have. I call Elements "the little book that could," because it could and it did. It changed my life in a great way. I have to give that all up to also my team, a group of people that believe in me and not only believe in me but also the projects. Rhiannon Rasmussen-Silverstein, Christina Mackenzie, Melanie Ujimori, and so many other people have come together to help me make these things exist, and that I can never say enough thanks for.